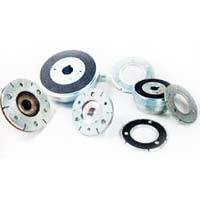 We are counted among the prominent Manufacturers, Suppliers, and Service Providers of Bearing Mounted Clutches. 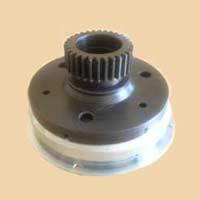 The Bearing Mounted Clutches provided by us is designed as per the current market requirements. Developed using hi-tech machines and advanced technology, our Bearing Mounted Clutches are highly durable and cost effective. 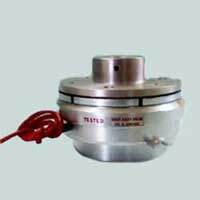 The Bearing Mounted Clutches which we make available find their application in various industries. Bearing mounted clutches are normally off type and operate on DC voltage. On applying DC voltage to the stator (coil) strong magnetic field is produced, which pulls the armature towards the friction material of the rotor over the air gap and torque gets transmitted free of back lash. On switching off power supply, the unique pre-stressed spring the armature back into the original position and clutch is positively released free from residual torque. Normally off type clutches operate on D.C. voltage, hence A.C. to D.C. conversion is done by means of a suitable rectifier. Switching of the clutch can be on either side. However, once application demands, higher switching frequency / faster engagement and disengagement time, switching must be carried out on D.C. side. To restrict the high inductive voltage / back EMF a suitable suppressor and capacitor network is provided across the contactor coil.